We’re a family of animal lovers. We have two pets of our own (a dog and a cat) and are always looking for ways to help other animals. One of the best ways is through our local animal shelter. Supporting your animal shelter (or Humane Society) is a great way to make a difference in your own community. Whether you volunteer to walk dogs, pet cats, or make monetary donations, every little bit helps. 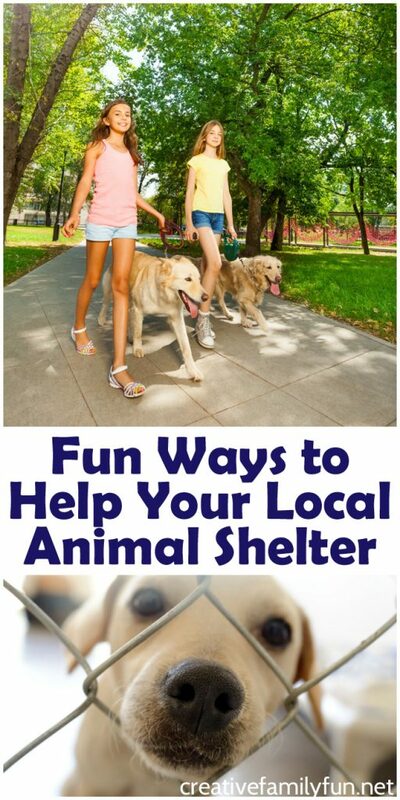 Here are some fun ways your family can do together to help your local animal shelter. It’s so valuable to spend time together as a family doing service projects. Are you ready to help some animals? We are! My kids’ wish lists are getting shorter and shorter over the years because they have so many things. So, if you’re anything like us, use your next birthday to help raise money for your local animal shelter. Instead of gifts, ask your friends to bring a small donation or, if you don’t want to ask for money, ask them to bring dog toys, cat litter, cat toys, food, scratching posts, rawhides, or collars. Check with your local shelter for specifics. Most have wish lists available online or will provide you one if you call. Animal shelters can always use volunteers. You can walk dogs, pet cats, help clean, or even stuff envelopes. There are plenty of jobs for volunteers. But, it’s likely that your local animal shelter has an age limit for volunteering so check first. If you child is old enough, go visit the animals together. This is a great way to spend family time with a tween or teen! If your kids are still too young, there are plenty of other ideas in this post that they can do! Start a small donation drive to collect blankets and towels. Shelters can use these in so many ways. Go through your home and see what you can donate. Involve your kids and let them call grandma or grandpa to see if they have any old blankets or towels to donate. You can also ask other family members, neighbors or friends. Finally bring the kids along when you drop your donations off so that they can see this service project from start to finish. 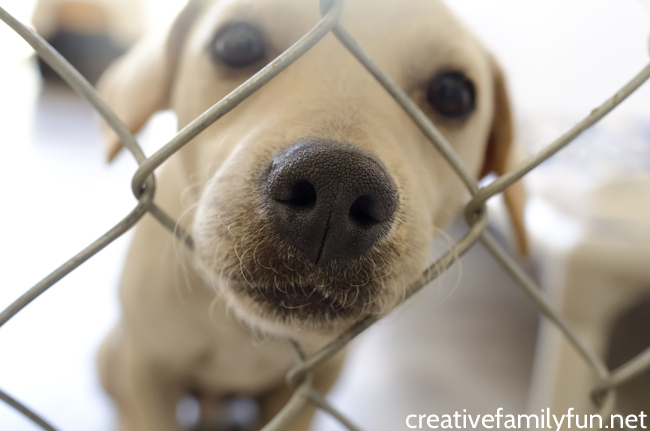 Brainstorm some ideas for ways you can raise money for your local animal shelter. Have a bake sale, a garage sale, collect change, have a lemonade stand, or whatever your creative minds can come up with. Involve the family from start to finish as you plan, implement, and have fun with a small fundraising campaign. Grab your local shelter’s wish list, set a budget, and go out shopping. Let your kids pick out items to donate while staying within the budget. Before you go home, stop off at the shelter to donate all your purchases. 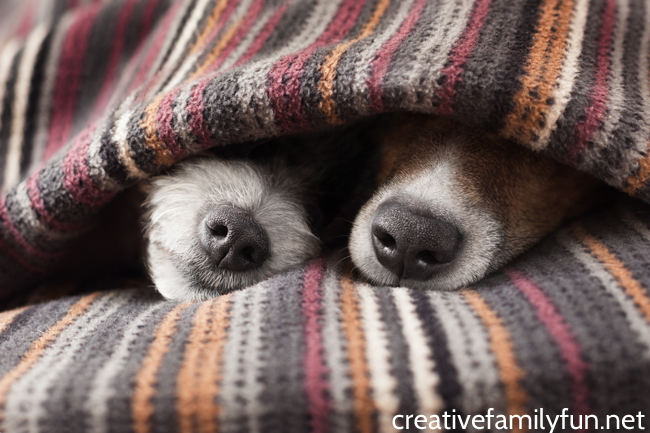 If you’ve got the time and the space, your family can serve as a foster home for animals. Sometimes shelters don’t have enough space for all the animals that need help and could use your help. This is a much bigger commitment than the other ways to help your local animal shelter, but it’s an incredibly valuable experience. If you are interested, contact your local shelter or rescue organization and they will help you determine if your family is a good fit for fostering and will often provide training. 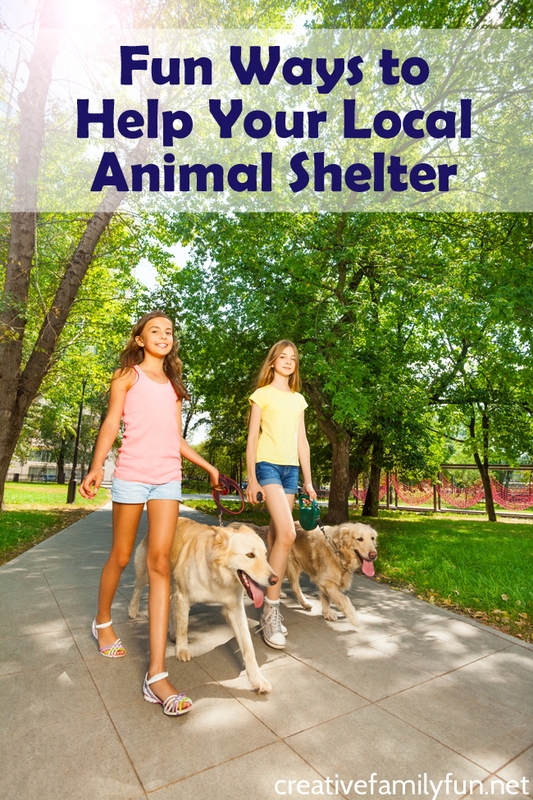 What are some ways your family likes to help your local animal shelter?